Sebastian Vettel | Take Home a Souvenir! Sebastian Vettel yesterday made Formula 1 history after becoming only the fourth man ever to won four world championships. Only Michael Schumacher has won more consecutive titles – of his seven championship wins, five came between 2000 and 2004 – a five-year spell that Vettel could match if he continues next season in similar form. With three races still remaining in this year’s Formula 1 race calendar, Vettel sealed his championship win with a race victory in India. You can read the race highlights from the Indian Grand Prix on the BBC website, along with a short profile of Sebastian Vettel. Vettel’s victory also secured a fourth consecutive Constructors’ championship for his team at Red Bull Racing. Souvenir Press publishes the only English-language biography of Sebastian Vettel, featuring exclusive contributions in their own words from Sebastian himself and his Red Bull team-mate Mark Webber, and filled with colour photos throughout (many previously unpublished and exclusive to this book). To celebrate Sebastian Vettel’s fourth consecutive championship title, why not treat yourself to a copy of Meet Sebastian Vettel, published by Souvenir Press. A must-have gift for any Vettel fan, and packed with photographs to see you through the close season until racing starts again next year. Congratulations to Sebastian Vettel and all of the team at Red Bull Racing on their fourth consecutive Drivers’ and Constructors’ championship wins. We’re now two races in to the 2013 racing season, and after these first two races Sebastian Vettel is already making his intentions clear, trying to start the new season where he left off: with victory in the 2012 season. But it has not been without controversy. After a podium finish for the Red Bull driver in the first race of the season in Melbourne last weekend, hopes were high when Vettel started the Malaysian Grand Prix this weekend from pole position. And it was looking good for a Red Bull 1 and 2, when after the final round of pit stops Vettel fell into place behind his teammate Mark Webber. Radio orders from the team instructed both drivers to maintain their positions and carry on to the end, conserving their tyres and fuel. But, to great controversy, Vettel had other ideas. Always a competitive racer, he and Webber were engaged in a ferocious battle for first position, and Vettel eventually made the pass stick thirteen laps from the finish. The race finished with Vettel in first position, Webber fuming in second (and his anger at his teammate was evident even whilst on the podium), and they were joined by Lewis Hamilton in third, his first podium finish for his new team Mercedes. The upshot of this is that Vettel is now nine points clear at the top of the drivers’ standings, clearly signalling his intent for this season. 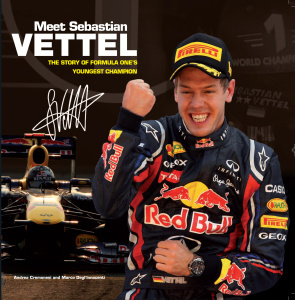 For the first English-language biography of Sebastian Vettel, read Meet Sebastian Vettel, published by Souvenir Press.